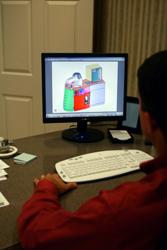 Do you know if your CAD files can translate into the product you envision? Our Design Assessment team looks at your CAD files to see how we can best produce it while keeping the quality and exceptional details you need. Like you, we are committed at every stage to maintaining the integrity of your design. If you are not working with a designer we can help you find someone who will meet your needs and exceed all your expectations for quality and innovation. Read more about our Design-Develop-Deliver process and then contact us to help turn your designs into products people buy. Contact us or send us your CAD files - we'll help you get from files to finished product in 4-6 weeks!